On the west side of the island in the traditional village Kalamitsi 4 km from the beach is the property Liofos which it consists of 6 fully equipped studios and two apartments that can accommodate 2-5 people. 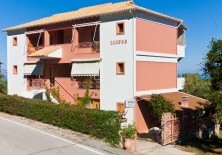 Most studio overlooking the Ionian Sea. Our aim is your stay is pleasant and quiet away from city noises. At a distance of 50 m is a playground. In the village you can find traditional tavernas and mini markets. Good morning, we are a couple and we would like to stay at your place from the 29th of August to the 05th of September. Are there some services and what about public transport? We are a couple who would like to stay at the Vs. studios. We ask availability and cost of 1 apartment with kitchen for the period 07/08 – 14/08.